Manufacturing, Trading, Importer and Exporter of Electrotherapy Equipments etc. 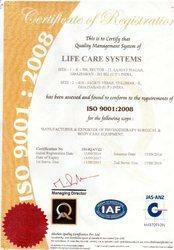 Started in 2000, Life Care Systems (LCS) is established in Ghaziabad as a manufacturer, exporter and supplies of an inclusive range of medical devices including physiotherapy, slimming, surgical and other equipments. Under the guidance of Mr. Anil Singhal, we are proficiently putting our efforts to achieve accomplishment. Being the leading manufacturing, exporter and supplier of medical equipments, we are able to provide a quality range of medical equipments to our customers. These products have ‘zero-effect’ that constantly gets upgraded and improved with latest technology.